AIRLINES ARE HIRING - Get FAA approved hands on Aviation training. Financial Aid for qualified students - Career placement assistance. CALL Aviation Institute of Maintenance 888-686-1704 BATHROOM RENOVATIONS. EASY, ONE DAY updates! We specialize in safe bathing. Grab bars, no slip flooring & seated showers. Call for a free in-home consultation: 888- 912-4745 CARS/TRUCKS WANTED!!! 2002 and Newer! Any Condition. Running or Not. Competitive Offer! Free Towing! We're Nationwide! Call Now: 1-888-416-2330. CASH FOR CARS: We Buy Any Condition Vehicle, 2002 and Newer. Nationwide Free Pick Up! Call Now: 1-800- 864-5960. DENTAL INSURANCE: Call Physicians Mutual Insurance Company for details. NOT just a discount plan, REAL coverage for 350 procedures. 888-623-3036 or http://www.dental50plus. com/58 Ad#6118 DISH TV $59.99 For 190 Channels +$14.95 High Speed Internet. Free Installation, Smart HD DVR Included, Free Voice Remote. Some restrictions apply 1-800-718-1593 INVENTORS - FREE INFORMATION PACKAGE Have your product idea developed affordably by the Research & Development pros and presented to manufacturers. Call 1-888- 501-0236 for a Free Idea Starter Guide. Submit your idea for a free consultation. NEW AUTHORS WANTED! Page Publishing will help you self-publish your own book. FREE author submission kit! Limited offer! Why wait? Call now: 866-951-7214 OVER $10K in debt? Be debt free in 24-48 months. No Upfront fees to enroll. A+ BBB rated. Call National Debt Relief at 866-243- 0510. OXYGEN - ANYTIME. Anywhere. No tanks to refill. No deliveries. The All- New Inogen One G4 is only 2.8 pounds! FAA approved! FREE info kit: 844-558-7482 REACH MILLIONS of homes nationwide with one easy, affordable buy in the NANI Network! For more information go to www.afcp. org/nani REVERSE MORTGAGE:Homeowners age 62+ turn your home equity into tax-free cash! Speak with an expert today and receive a free booklet. Call 1-866- 880-2444 SAVE ON YOUR NEXT PRESCRIPTION! World Health Link. Price Match Guarantee! Prescriptions Required. CIPA Certified. Over 1500 medications available. CALL Today For A Free Price Quote. 1-866- 293-9702. Call Now! SPECTRUM TRIPLE Play! TV, Internet & Voice for $29.99 ea. 60 MB per second speed. No contract or commitment. More Channels. Faster Internet. Unlimited Voice. Call 1-877- 338-2315. STAY IN your home longer with an American Standard Walk-In Bathtub. Receive up to $1,500 off, including a free toilet, and a lifetime warranty on the tub and installation! Call us at 1-855- 534-6198. **STOP STRUGGLING ON THE STAIRS** Give your life a lift with an ACORN STAIRLIFT! Call now for $250 OFF your stairlift purchase and FREE DVD & brochure! 1-855-388-6710 HARDWOOD FLOOR Sander/ Helper: Full time, reliable, willing to train. Call Jason at 401-640-9338. HOME HELP: Some driving & household duties, light cooking. Good hours & salary. 401-331-5552. SMITHFIELD PUBLIC SCHOOLS CUSTODIAL POSITION: Full-time 1st shift. Excellent Salary and Benefits. Qualified candidates may apply online at www. SchoolSpring.com or applications are available at the Smithfield School Department Administration Office, 49 Farnum Pike, Smithfield, RI 02917 Application deadline: November 16, 2018. EOE VALLEY BREEZE DELIVERY DRIVER Now accepting applications for delivery driver. Good driving record and proof of insurance required. Neat, clean, professional appearance necessary. Perfect for the healthy retiree. Must be available 6:30 a.m. -12 p.m. Wednesdays & Thursdays. Apply in person, Wednesday-Friday, 8:30- 5 p.m., The Valley Breeze, 6 Blackstone Valley Place, Suite #204, Lincoln. No phone calls please. WHA JOB FAIR Friday, Nov. 9th, 9 am to Noon 100 Front St. Woonsocket, RI Immediate Openings Resident Services Coordinator Full Time, Mon-Fri $40-$45k Union Position & Benefits Maintenance Aide - Part Time 8 a.m.-12 noon, Mon-Fri $11.10/hr. Maintenance Aide - Part Time 8 a.m.-2 p.m., Mon-Fri $12/hr. Come prepared for an Interview See complete Job Descrip- tions on our website WWW.WOONSOCKETHOUSI NG.ORG JACKIE'S HOME DAYCARE Are you looking for an affordable daycare? My home offers a safe environment for your child to learn, play and grow. Jackie Rice 401-658-4868 HARRISVILLE: Yard Sale. Sat., Nov. 10th, 7 a.m. - 4 p.m. 685 Round Top Rd. Old toys, pedal tractor, jewelry, musical instruments, tools, fireman's antiques & much more. Early birds welcome! NORTH SMITHFIELD: Multi-Family Yard Sale. Sat., Nov. 10th, 9 a.m. - 3 p.m. 25 Hillview Ave. Home decor, army issued clothing, furniture, wall art, children's books, fishing gear, and more. 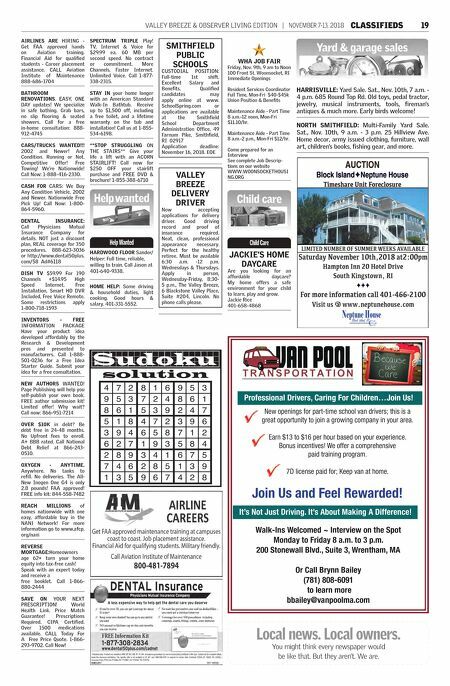 VALLEY BREEZE & OBSERVER LIVING EDITION | NOVEMBER 7-13, 2018 CLASSIFIEDS 19 Sudoku solution Professional Drivers, Caring For Children…Join Us! Join Us and Feel Rewarded! It's Not Just Driving. It's About Making A Difference! New openings for part-time school van drivers; this is a great opportunity to join a growing company in your area. Earn $13 to $16 per hour based on your experience. Bonus incentives! We offer a comprehensive paid training program. 7D license paid for; Keep van at home. 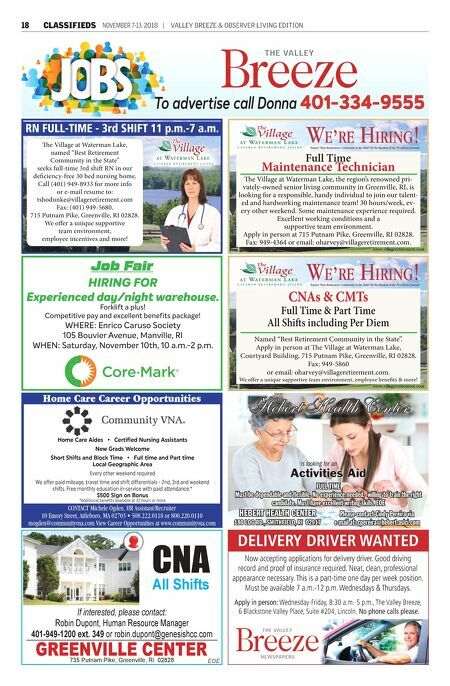 Walk-Ins Welcomed ~ Interview on the Spot Monday to Friday 8 a.m. to 3 p.m. 200 Stonewall Blvd., Suite 3, Wrentham, MA Or Call Brynn Bailey (781) 808-6091 to learn more bbailey@vanpoolma.com Local news. Local owners. You might think every newspaper would be like that. But they aren't. We are.